Ninebot ES2 comes almost fully assembled out of the box. You only need to attach the handlebar with 4 screws (tools are included as well). Further you get a charger and cable to load the built-in battery. 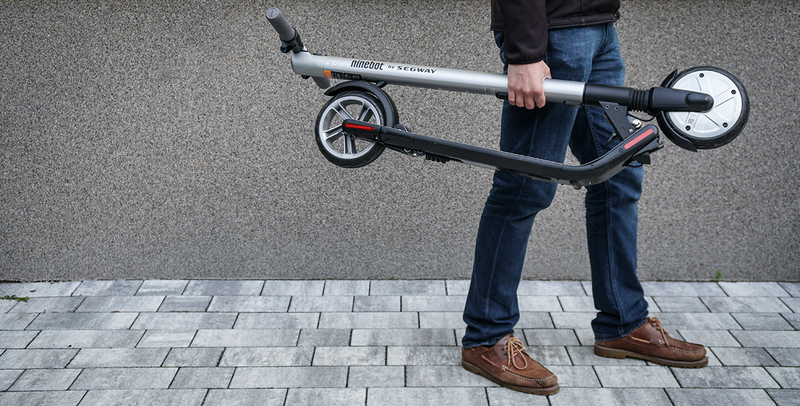 The sturdy frame of Ninebot ES2 scooter is made of metal and the scooter weights 12.7 kg. You have a good stand on the footstep which is 55cm long and 15 cm wide. With a rubberised finish you keep a strong and non-slippy position while standing. The max weight of the driver should exceed 100 kg. Below the footstep there’s a foldout stand to sturdy park your scooter. Ninebot ES2 folds within seconds, the mechanism sits between steering bar and footstep. The crossbar then connects to the cover of the back wheel to easily carry your scooter which feels well balanced. Ninebot ES2 is IP54 certified, which means it is splashproof. 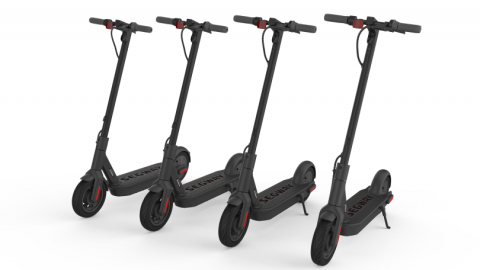 The 300W motor sits within the front wheel and accelerates the scooter up to a speed of a little over 25km/h. A built-in 187 Wh battery sits in the steering rod. According to company info it get’s you 25km far, but this value seems a bit exaggerated. The stated charging time of 3,5h is also a bit optimistic, it’s rather 4h. But you can upgrade! 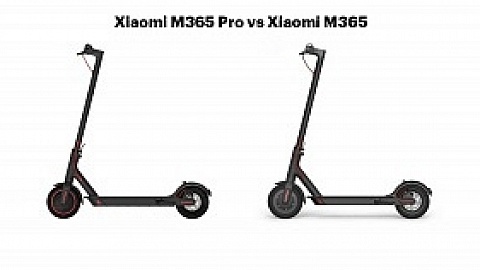 You can hook up an additional battery to the rod to extend range to 45km and increase top speed to 35 km/h. Segway Ninebot ES2 features a small display on the handle bar that indicates your driving speed, battery level, Bluetooth connection & power mode. A white front LED is integrated in the bar and a red tail light is mounted on the back. They can be activated by short pressing the power button when ES2 is powered on. A bell is missing which is legally required in some countries. Further Ninebot ES2 offers an underbody light. The 16 LEDs can be controlled via app and offer several effects and colors. Segway Ninebot ES2 uses solid rubber tires, so no worries about punctures. They are not shock absorbing, but therefor ES2 offers suspension. Attention: While ES2 offers suspension on front and back, ES1 only offers suspension on the front. The suspension is essential for a smooth ride so I recommend going for ES2 model! Integrated in the front wheel there is an eABS, anti-lock braking system and is operated with a handle on the steering bar. It is a regenerative system, which means the power produced during deceleration flows back into your battery. The auxilliary back wheel break is mechanical, you have to step on the wheel cover. The handling bar holds the break lever (grey) on the left and the accelerator (blue) on the right. In the middle there’s the display and the power button. If you short press the power button twice when turned on, you can switch between Eco (5 km/h), Normal (15 km/h) and Sport mode (26 km/h). The current mode is indicated with the (S) icon on the display. No icon means Eco mode, a blue S stands for normal mode and a Red S indicates sport mode. Ninebot ES2 is a pedal assisted e-scooter. That means you need to give it an initial push and then accelerate after reaching a basic speed. Afterwards you can cruise fully on electric power. 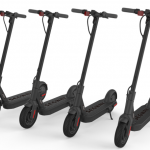 Segway ES2 features a cruise control which has to be activated via smartphone app upfront. If you keep pushing the accelerator for longer than 5 sec, a waring tone sounds and the speed is constantly hold. Tap either break or accelerator lever to deactivate cruise control. As already mentioned a few features like cruise control have to be activated via app. Segway Ninebot ES2 also offers anti theft protection. When activated the tires are blocked as soon as someone tries to move your scooter and it starts beeping. Additionally the app reads out live data such as current speed, average speed, milage, battery info,… Firmware updates are also accomplished via app. Ninebot ES2 is an ideal companion for short and longer distances. 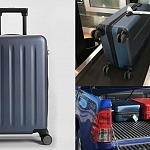 It conveniently folds to fit into your truck or to be carried on public transport. After a short manual push you can cruise with even a bit more than 25km/h. The stated 25km range are a bit exaggerated but you can reach about 20km. When the battery status falls below 10% the power of the motors goes down. Steep hill upwards up to 10% are no problem for ES2, if it is steeper you have to support manually. As the battery sits in the steering rod you get a pretty good feeling while steering. 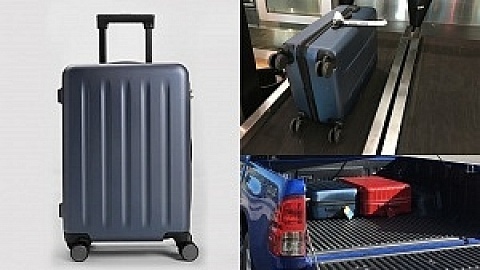 It’s also easy to quickly move within public transport as the footstep is light to be turned fast. 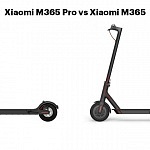 The suspension does a good job smoothening uneven pavement although it is not as smooth as the air tyres used in Xiaomi M365. If you are interested in both of them, also take a look at my comparison review. Another negative side effect of the suspension is the feeling while accelerating or breaking. As it yields it doens’t give a sturdy feedback. I really like the break system: the main break is the electronically break that regenerates battery. But you also got a mechanical auxiliary system. The display on the steering bar shows you all the info you need and the underbody light gives your scooter an individual sweet touch. I really enjoy cursing around with it. Careful, don’t mix it up with Ninebot ES1!